other information Kells KM 9513, 1997. 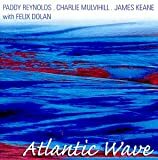 Partial remastering of Sweet and Traditional Music of Ireland, Rego R-1000, 1971, combined with new material from James Keane and Felix Dolan. Notes especially thanks to Don Meade.